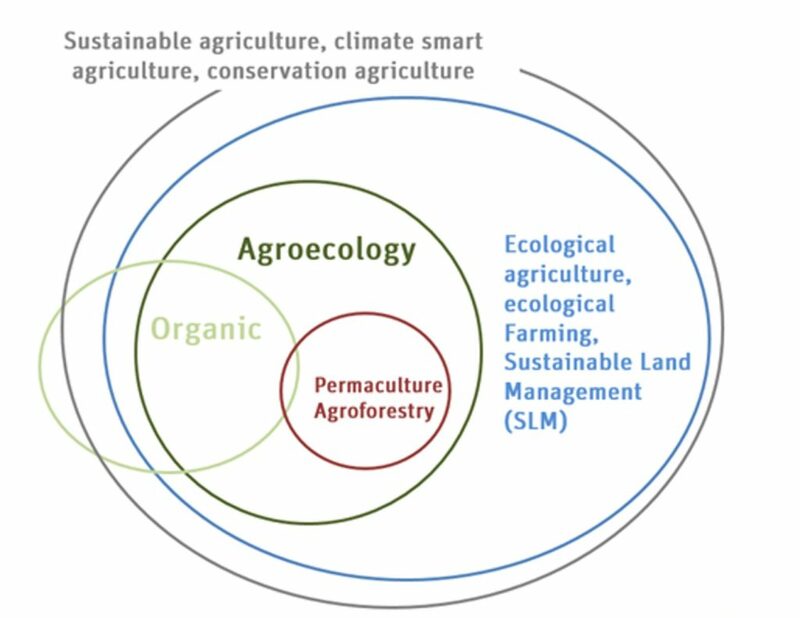 Many terms and concepts are associated to agroecology and sustainable food production. Among the most relevant and common approaches on sustainable food system, we can mention sustainable agriculture, climate-smart agriculture, conservation agriculture, ecological agriculture, organic agriculture, permaculture or fair-trade. Some of those concepts overlap, some are nested in each other, while some only share a few principles. For instance, fair-trade is more focused on social aspects of farming systems and sustaining smallholder’s livelihoods, while organic agriculture has a bigger emphasis on reducing external inputs and supporting market labels. Other commonly used concepts in agriculture are: low-external input agriculture or people-centered agriculture, bio-dynamic, ecosystem-based approach, save and grow, restoration agriculture, sustainable intensification, climate resilient agriculture, food sovereignty, fair-trade. Discover the differences between the different approaches in food production. CSA is based on a partnership, usually formalised as an individual contract between each consumer and the producer, and characterised by a mutual commitment to supply one another (with money and food) over an extended period of time, beyond any single act of exchange. The contracts, oral or written, last for several months, a season or a year. CSAs are part of an active approach to relocalising the economy. But local in the CSA movement is not restricted to a geographical meaning. The idea is that local producers should be well integrated into their surrounding areas: their work should benefit the communities which support them. CSAs are based on solidarity between producers and support groups and involve: Sharing both the risks and the benefits of a healthy production that is adapted to the natural rhythm of the seasons and is respectful of the environment, natural and cultural heritage and health. ; Paying a sufficient fair price up-front to enable farmers and their families to maintain their farms and live in a dignified manner. The ecosystem approach is a strategy for the integrated management of land, water and living resources that promotes conservation and sustainable use in an equitable way. It is based on the application of appropriate scientific methodologies focused on levels of biological organization which encompass the essential processes, functions and interactions among organisms and their environment, and recognizes that humans, with their cultural diversity, are an integral component of ecosystems. Secretariat of the Convention on Biological Diversity 2004. “The Ecosystem Approach, CBD Guidelines”. Montreal: Secretariat of the Convention on Biological Diversity. Organic agriculture is a holistic production management system which promotes and enhances agro-ecosystem health, including biodiversity, biological cycles, and soil biological activity. It emphasises the use of management practices in preference to the use of off-farm inputs, taking into account that regional conditions require locally adapted systems. This is accomplished by using, where possible, agronomic, biological, and mechanical methods, as opposed to using synthetic materials, to fulfil any specific function within the system. Permaculture is the conscious design and maintenance of agriculturally productive ecosystems which have the diversity, stability, and resilience of natural ecosystems. It is the harmonious integration of landscape and people providing their food, energy, shelter, and other material and non-material needs in a sustainable way. Ferguson, R.S. & Lovell, S.T. (2014): “Permaculture for agroecology: design, movement, practice, and worldview. A review”. Agron. Sustain. Dev. 34: 251. “Precision agriculture is a management strategy that utilizes site-specific information to precisely and economically manage and optimize production inputs. A management system that is information and technology based, is site specific and uses one or more of the following sources of data: soils, crops, nutrients, pests, moisture or yield, for optimum profitability, sustainability and protection of the environment. It encompasses the use of computers, satellite positioning systems and remote sensing devices to provide information on which enhanced decisions can be made”. A sustainable food system (SFS) is a food system that ensures food security and nutrition for all in such a way that the economic, social and environmental bases to generate food security and nutrition of future generations are not compromised. Sustainable intensification has been defined as producing more from the same area of land while reducing negative environmental impacts and increasing contributions to natural capital and the flow of environmental services. FAO. 2011 “Save and Grow: A policymaker’s guide to sustainable intensification of smallholder production”. Rome: Food and Agriculture Organization of the United Nations.